Pune Cantonment Board (CB Pune), Pune published a new job notification for Medical officer (Full Time/ Part Time) Posts. The recruitment is for total 02 Vacancies. The willing candidates are informed to see the latest notification March 2019. Qualification required MBBS/DNB/Post Graduate and More. Walk – in Interview on 25th March 2019. 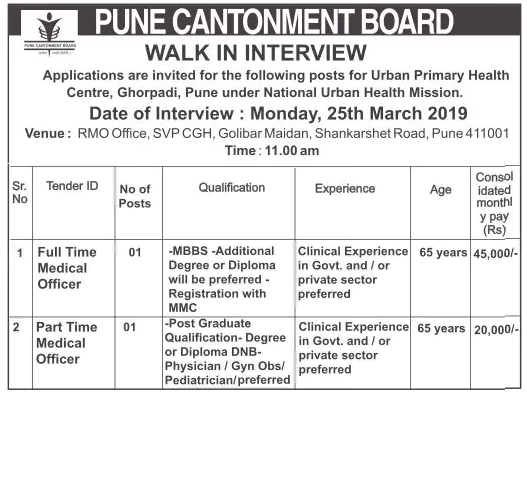 For More details of Pune Cantonment Board Recruitment 2019 Read Below. Education Qualification: MBBS/DNB/Post Graduate and More. For Post wise Education Details follow the detailed advertisement. Interested & Eligible candidates may attend for walk in interview along with all the documents addressed at RMO Office, SVP CGH, Golibar Maidan, Shankarshet Road, Pune – 411001. Walk – in Interview Date : 25th March 2019.